Employees can be suspended, terminated, resigned or deleted from an organisation. In each of the above cases, their access to the organisation's TeamWave account will be disabled. Suspended / Deleted is the status of their TeamWave account. 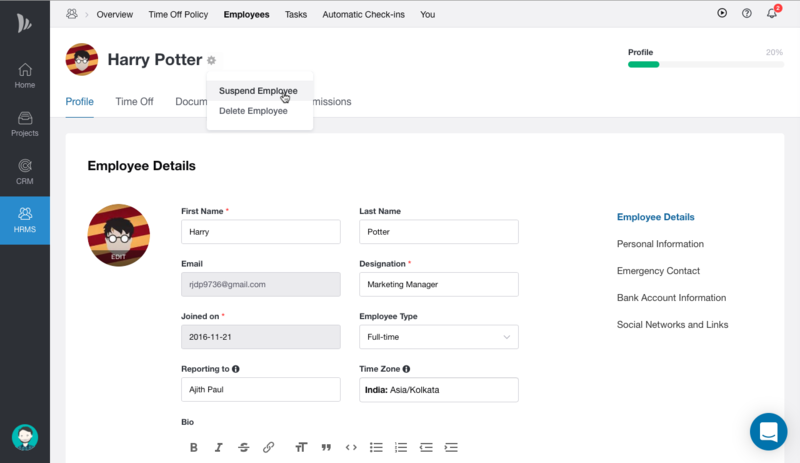 Suspending an employee will temporarily disable their access to their TeamWave account but can be revoked anytime by HR Admin and the account owner. One can use this option to restrict an employee's access for some time. Maybe as some disciplinary action. Since no data in employee's profile and their association with tasks/activities etc are lost, Suspended accounts will be continued to be billed. Terminating an employee will disable their access to their TeamWave account permanently and cannot be revoked. Terminate option is used when an employee is terminated/removed permanently from the organisation. To invite a terminated employee to your TeamWave account you need to invite him as a new employee with new email id. (To use the same email id, you need to delete the user and then invite him as a new employee). Since no data in employee's profile and their association with tasks/activities etc are lost, Terminated accounts will be continued to be billed. Resigning an employee will disable their access to their TeamWave account permanently and cannot be revoked. 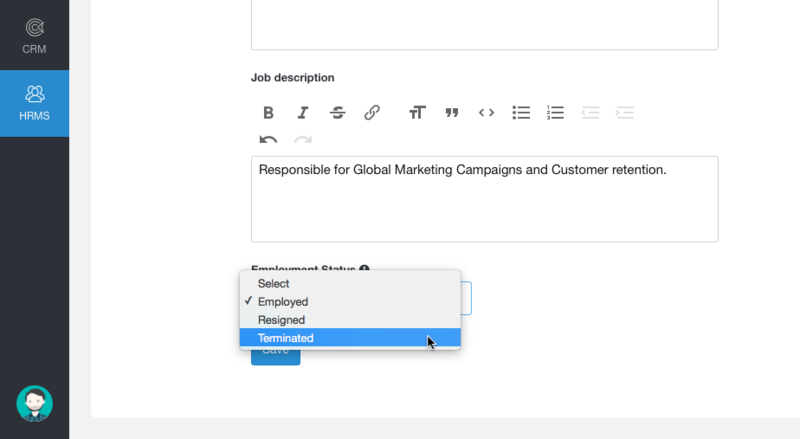 Resign option is used when an employee leaves a company permanently. Since no data in employee's profile and their association with tasks/activities etc are lost, Resigned accounts will be continued to be billed. 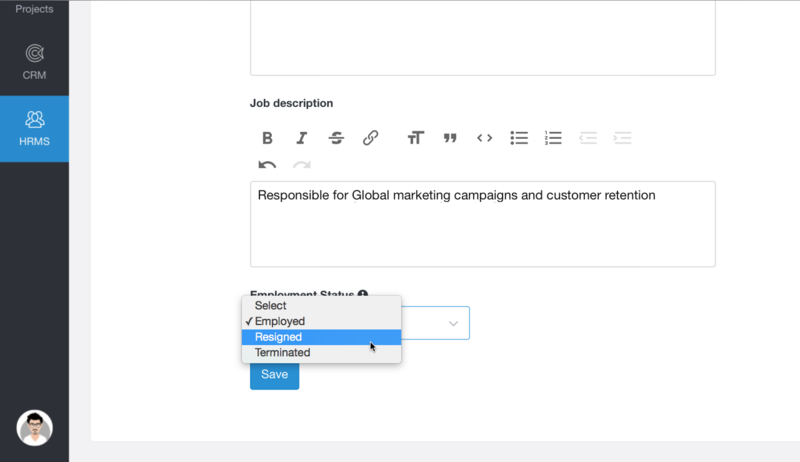 Deleting an employee’s TeamWave account will result in permanently deleting all the data in his account and remove the account’s association with Tasks/activities etc and cannot be revoked. 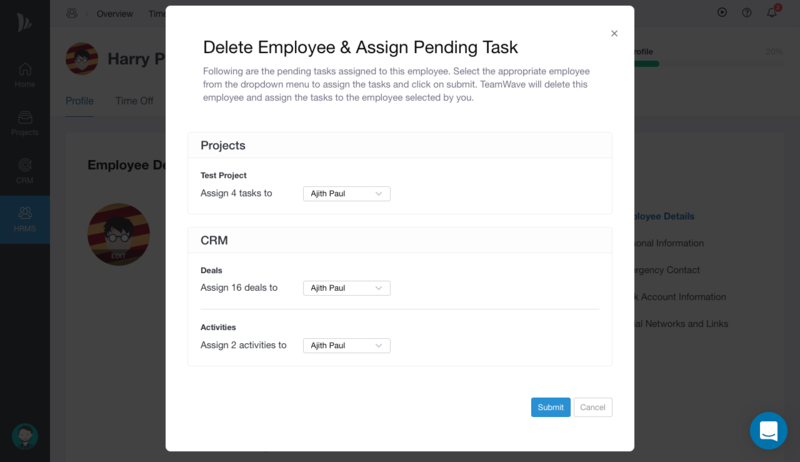 All the deals/tasks/activities assigned to that employee should have to be re-assigned to another employee before deleting. Deleted accounts will not be billed. You need HR Admin privileges to suspend, resign and terminate an employee, Whereas, only the account owner can Delete a user. Unless any user in Employee list is deleted, all the users of your organisation in TeamWave will be continued to be billed.